Mondrianbuntu operates in the colorful domain of non-representational user interfaces. 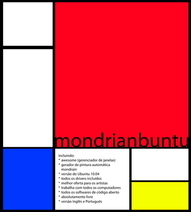 It deconstructs the familiar WIMP (window, icon, menu, pointer) model of a modern UI and turns it into a computer-aided, primitivistic painting – a heritage of Piet Mondrian. This painting is not as static as it might look – every mouse click generates a new graphical structure, transposing the viewer into a new dimension of Neoplasticism. Mondrianbuntu places its user into a simplified and harmonized world of geometrical utopia. Not being destructed by taskbars, widgets, applets, menus and other UI-annoyances the user finds peace and solitude while working with this system. Seemingly constrained, Mondrianbuntu environment provides head-space and stimulates imagination – values traded for anxiety and hecticness of contemporary user-interface implementations. On a more practical level, Mondrianbuntu is a very versatile tool for system administrators and programmers; no other UI is so well-suited to run multiple command-line applications at the same time! Thanks to the tiling model, the applications never overlap allowing the user to have a full picture of what’s going on the screen, at any time. And once a new working environment is needed – it’s just one click away.